And the past two weeks+ has been absolutely horrible. As soon as it hits about 7:30pm to 8pm the internet bandwidth goes from 100Mbps to 20mbps. Now the bandwidth obviously as bad as it is compared to what I normally get is not the issue. The problem is that my latency goes through the roof, which means my online games are ruined. I cannot play. My measely 20KB/s Dota2 connection gets 250 - 300ms constantly. No spiking just a constant lag. Its horrible considering I normally get 40 -50ms. Every since you brought in Netflix, clearly you cant handle the bandwidth with your infrastructure and my measely 20KB/s to play online is ruined. Its so frustrating. You can clearly see my home connection is fine, getting 11ms to the nearest Optus node. After that, its just terrible. Before 7:30pm I had a constant ping around 30 - 50ms. Which is where it should be, now its staying at 200minimum. This is 9pm, it was worse an hour ago, which I dont have the logs for. Optus, please let us know whats going. I have had Optus cable for over 13 years and this is the first time I have ever had issues. multiple complaints on Whirlpool and on the Optus forums but nothing yet as to what is happening. 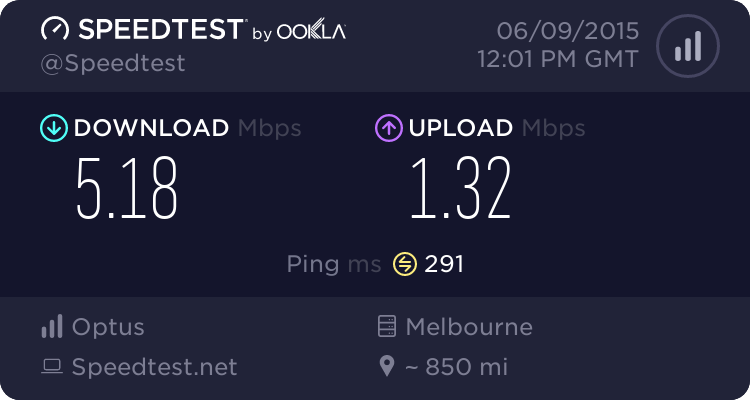 Also having the same issues in Reservoir VIC, had to reply to your thread.. Might have to try and cancel contract since they cannot expect me to pay over $100 a month for these speeds.. This thread sums it all up. It's Australia wide and it's appauling. Netflix has got to go, you just can't keep this up Optus. I've got similar problems at Vermont South. Around 10PM this evening, my download speed was down to 4Mbps. During the mornings, I can get 18Mbps and I used to be able to get that speed most times, with perhaps a drop to 15Mbps in peak periods. The impression I get is that this is an Optus-wide problem, not just one confined to a few localities. I suspect, but don't know, that it has got something to do with optus selling so much Netflix that they have outsold their cable capacity. It's not easy to see a solution. I've emailed a complaint but they say it could take up to 4 weeks to get a reply! Third world servoce, I say. There is no opportunity for live chatting and I dread to think of where the call centre is if I make a phone call. Having the same problem. No idea how Optus gets away with this terrible service. They sell a limited "unlimited" plan and have the worst customer support I have ever seen from a company this size. still horrible. still no reply from Optus. I just raised another ticket with them. I'm really getting the sh*ts with their 'heads in the sand' approach. Bundled $160pm (with premium speed) and cant even browse the internet at night. Sort your sh*t out optus. And Optus reply to all the threads except any related to the Netflix/Congestion issue. Coincidence. you guys are doing better than me. My speed right now is .54mbps. It's been horrible the past couple months.